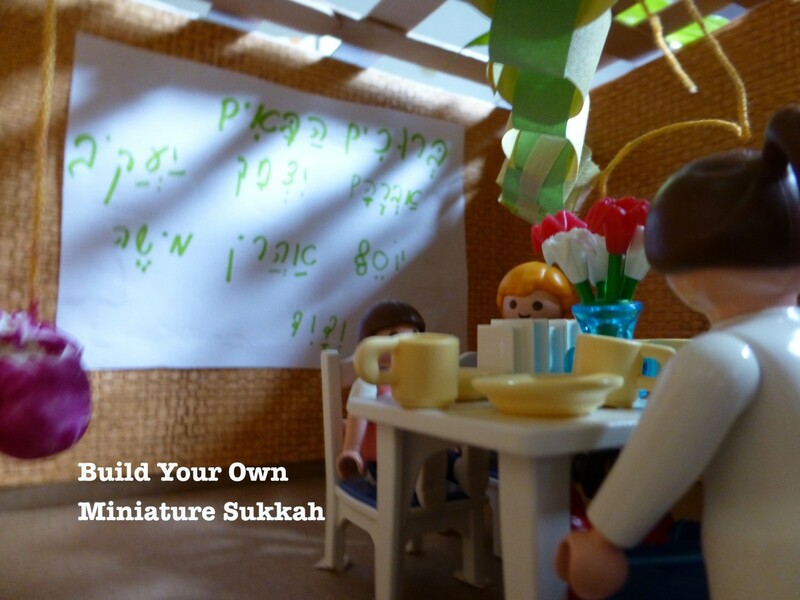 Get your kids excited about Sukkot by building a model sukkah. 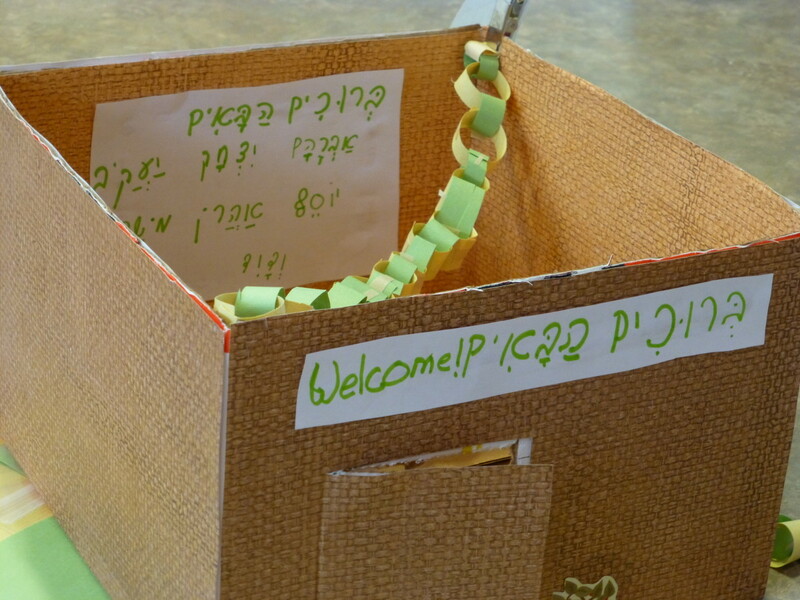 This craft is an ideal tool for teaching kids about the laws and customs of Sukkot while they have fun with arts and crafts. We did this as a family, but it could easily be done as a religious school activity for third-graders and up. (Younger children may not have the manual dexterity needed to make small, neat decorations.) 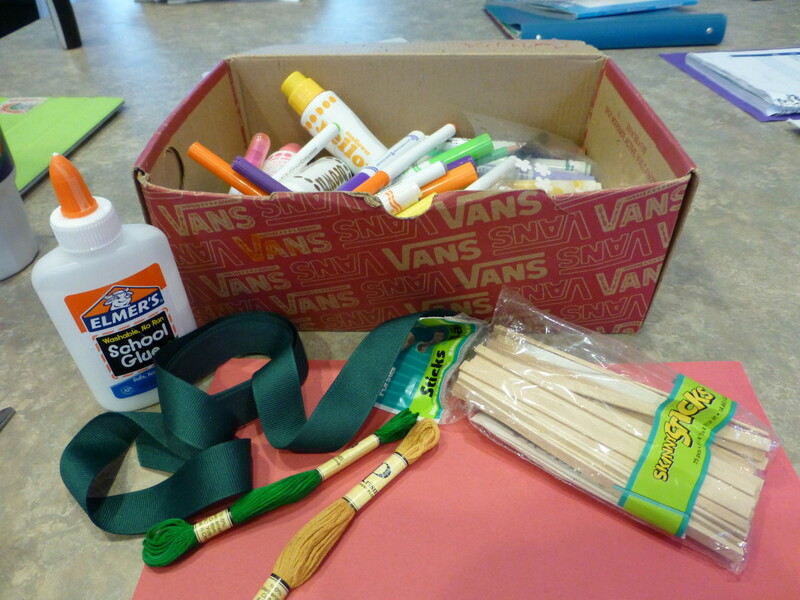 If you do this as a class activity, split a larger class into small groups (2–4 students per group), so everyone has a chance at hands-on building and decorating. Sukkot (also called the Feast of Booths or the Feast of Tabernacles) is a Jewish holiday celebrated in early fall. It is both a harvest holiday and a commemoration of the Israelites' 40 years of wandering in the desert before reaching the Promised Land. During the week of Sukkot, Jews are commanded to dwell in temporary booths like the Israelites and like the agricultural workers who lived in hastily built huts near their fields during harvest time. Most Jews today interpret the commandment of "dwelling" in the booths to refer to eating one's meals in the sukkah, although there are some people (usually in comfortable climates) who do spend the week sleeping in their sukkah, as well. However, not everyone has the space for a sukkah or the know-how to build one. What can you do if you don't have a sukkah of your own? 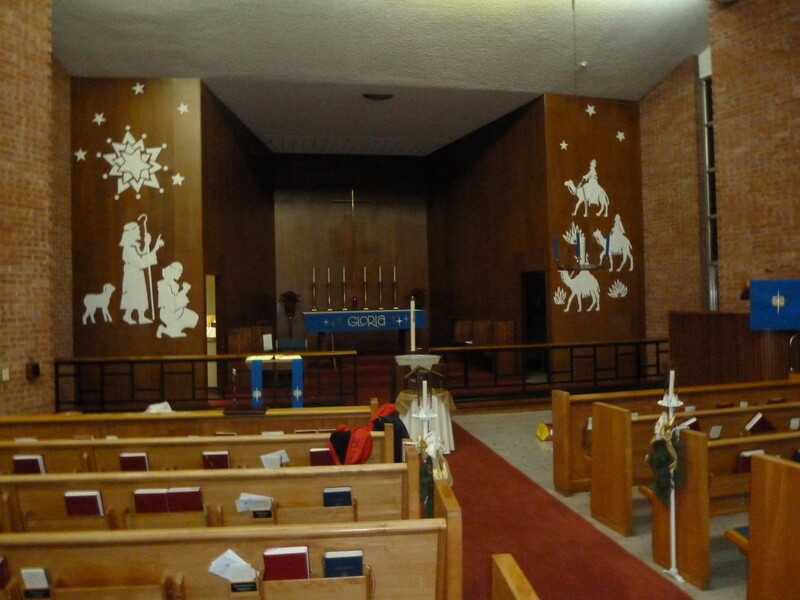 Eat meals in your synagogue's sukkah or at a neighbor's sukkah to fulfill the commandment. 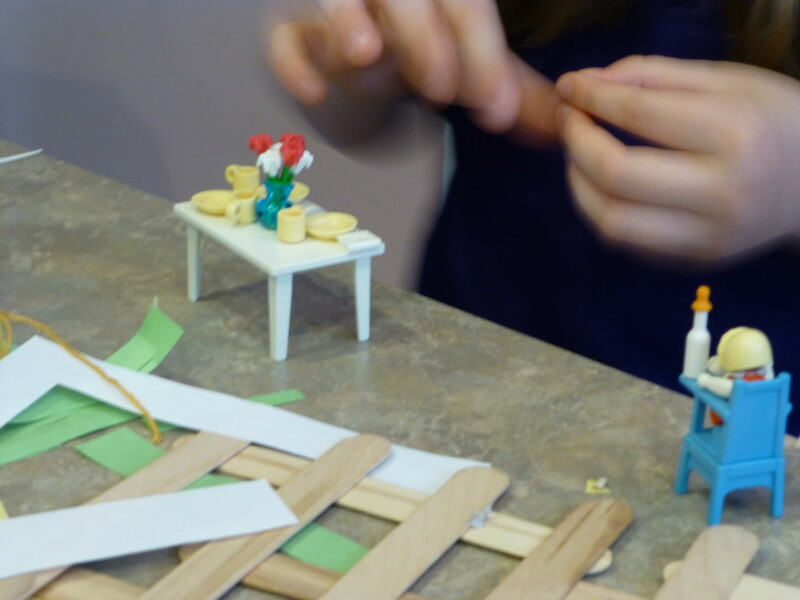 But what about the fun of building a decorating a sukkah? For many people, that's the best part of the holiday. 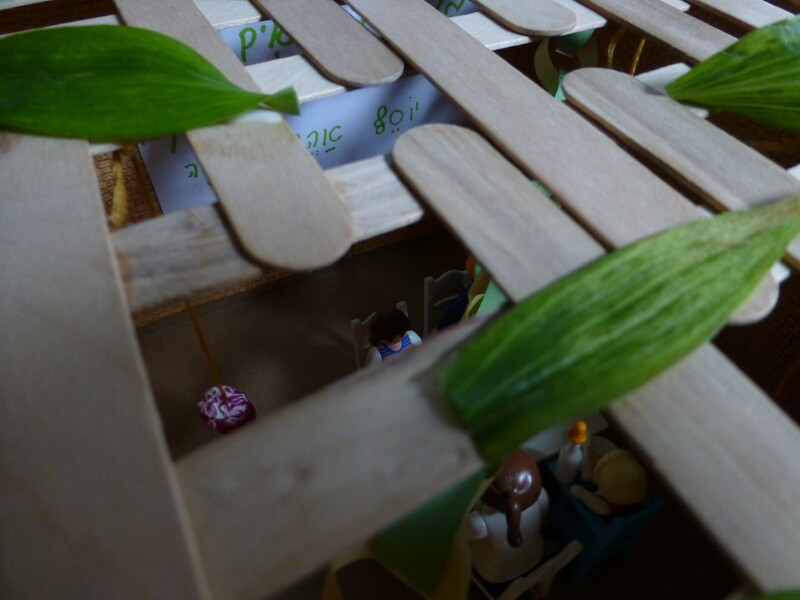 Build a model sukkah with your kids. Use it as a teaching tool for the laws of Sukkot, and make it a centerpiece for your holiday table! Be creative with your wall coverings! Solid construction paper makes a nice background for little posters inside. Scrapbook paper comes in patterns and textures that simulate all kinds of materials, including autumn leaves, grass, and fruit trees. 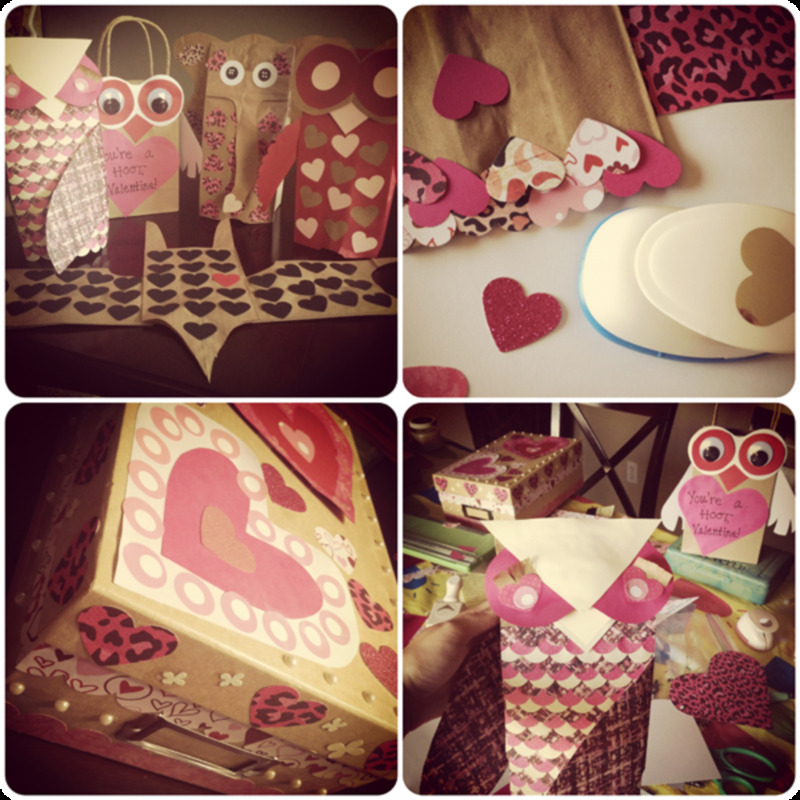 You can also use wallpaper scraps or paint the inside of the box. 1. 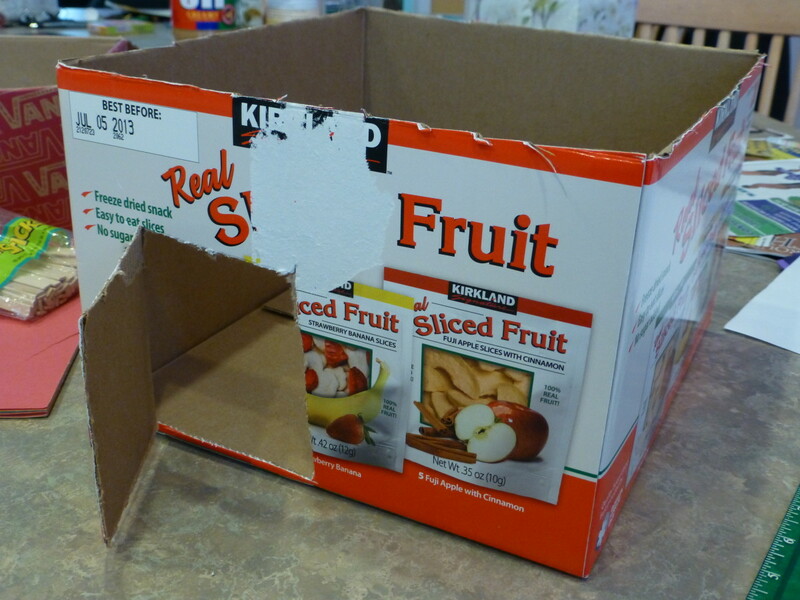 Using sharp scissors or a craft knife, cut off the flaps from your box and cut a door in the side. 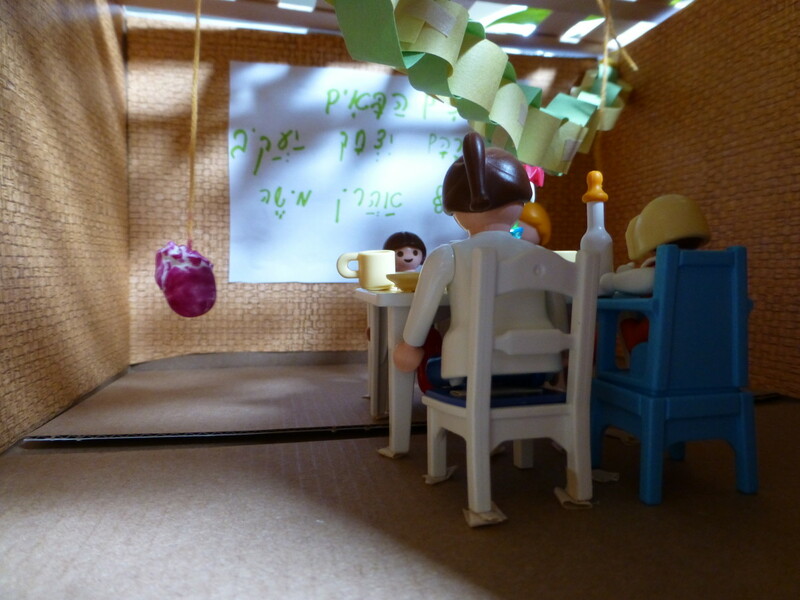 According to Jewish law, a sukkah must have at least two and a half walls, so you can cut out the fourth wall from your box if you want to see inside diorama-style. 2. 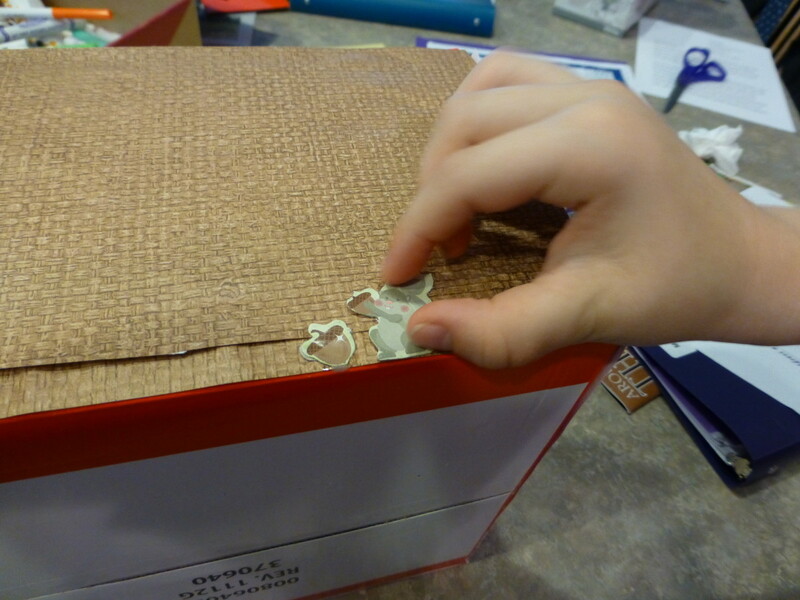 Cover the walls of your box with fabric or pretty paper. You'll probably want to cover both the inside and the outside, although you can use different materials for each. We used scrapbook paper in a burlap pattern, so we have the look of natural fabric walls without having to rummage through the fabric scraps. 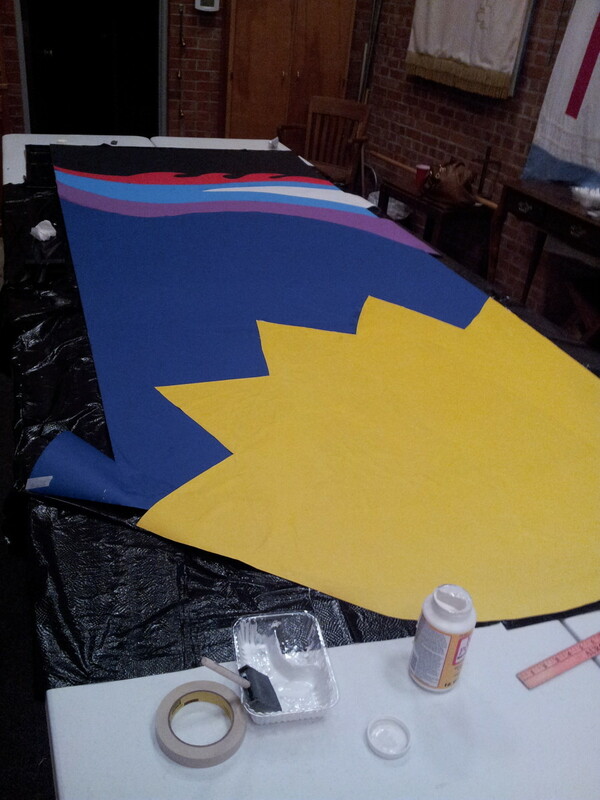 Measure the pieces you need before you cut them out so they'll fit properly. 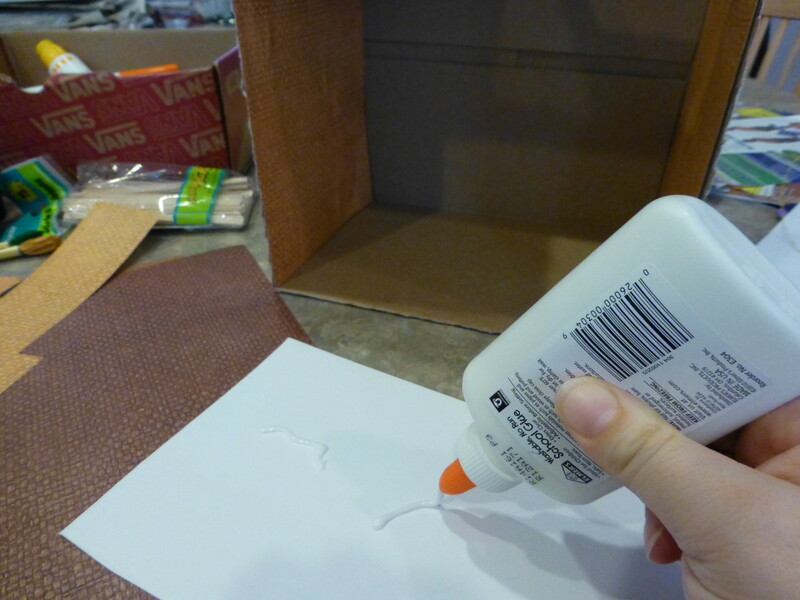 Use Elmer's school glue or tacky glue to stick your wall coverings onto the box. Don't forget to mark and cut out the location of the door before you glue paper onto the fourth wall! 3. While the glue on the walls is drying, make the schach. The schach (sometimes spelled skhakh or sechach) is the roof of the sukkah. You must be able to see the stars through the roof (and yes, that means the rain must be able to drip into your soup, too). We came up with the idea of gluing popsicle sticks into an openwork pattern, since we didn't have any long enough to go across by themselves. The schach on this miniature sukkah is not tied down, since the wind is not going to blow it away. 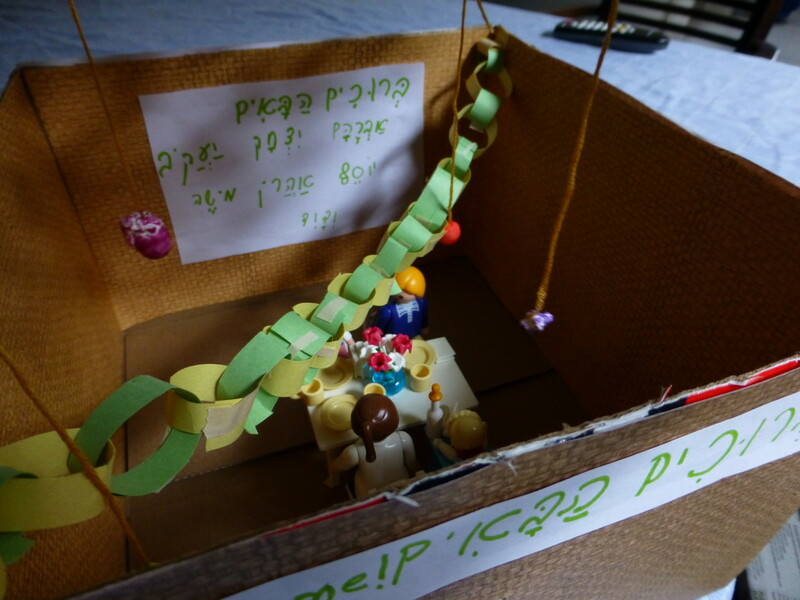 I let my kids take the lead in decorating the miniature sukkah. My daughter wanted to hang pretend fruit from the schach, just like we do in our real sukkah, so she made some from Model Magic, which my son colored with markers after they dried. 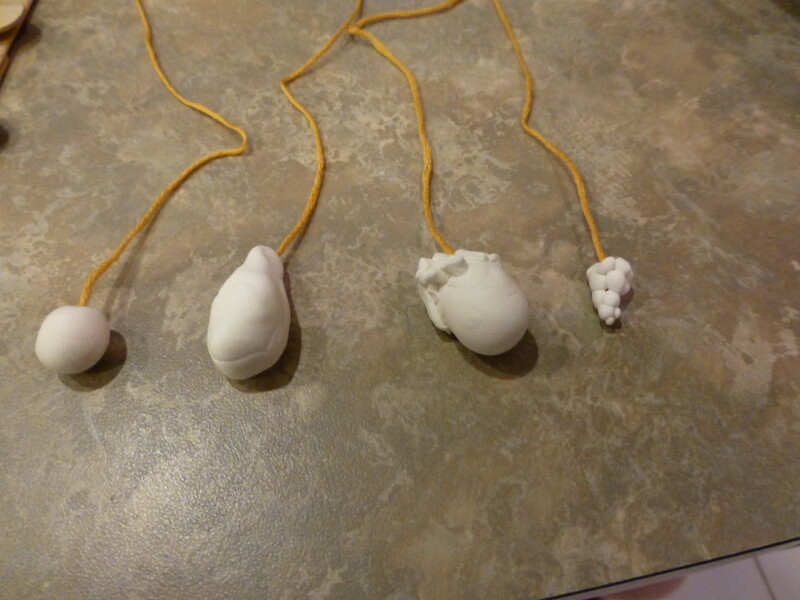 She molded them directly onto a piece of string, so she could tie them to the schach without having to wrap the string around and tie ugly knots. Then they decided on a pretty paper chain. This took real patience and perseverance, since my daughter had to cut tiny pieces of masking tape to make the paper circles. (Glue would work better, if you have the time.) 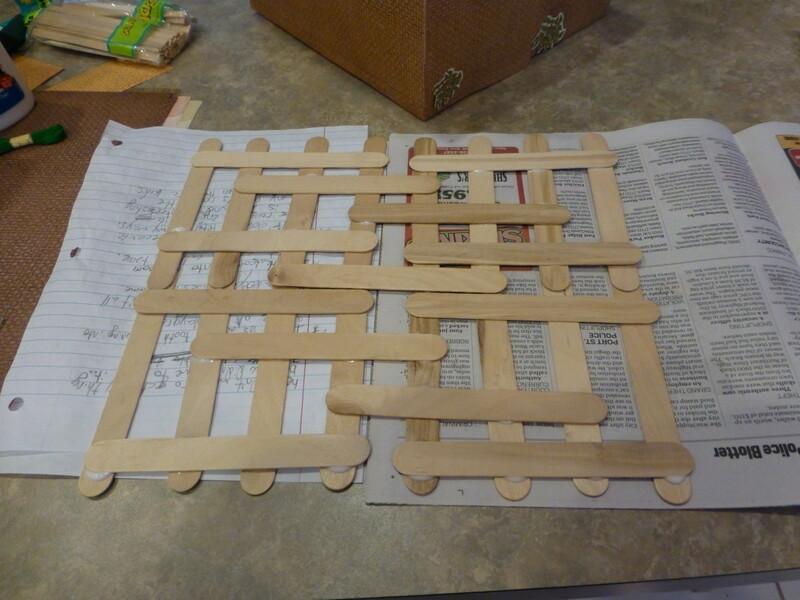 We glued the chain into the corners and held it in place with paper clips while it was drying. My son glued on some chipboard shapes left over from an old scrapbooking project. We had a squirrel that he glued onto the outside with some acorns, and some bushes to decorate the entrance. 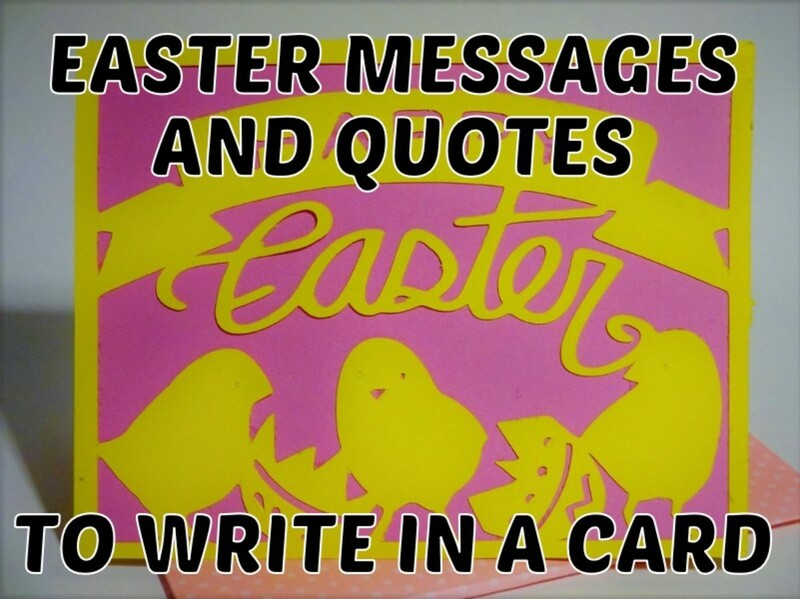 You could also use appropriate stickers, foam stickers, or pictures cut from magazines to add some color and interest. I insisted that posters were an integral part of a sukkah's decoration, so my daughter made a welcome sign and a sign for the ushpizin (traditional Sukkot guests). 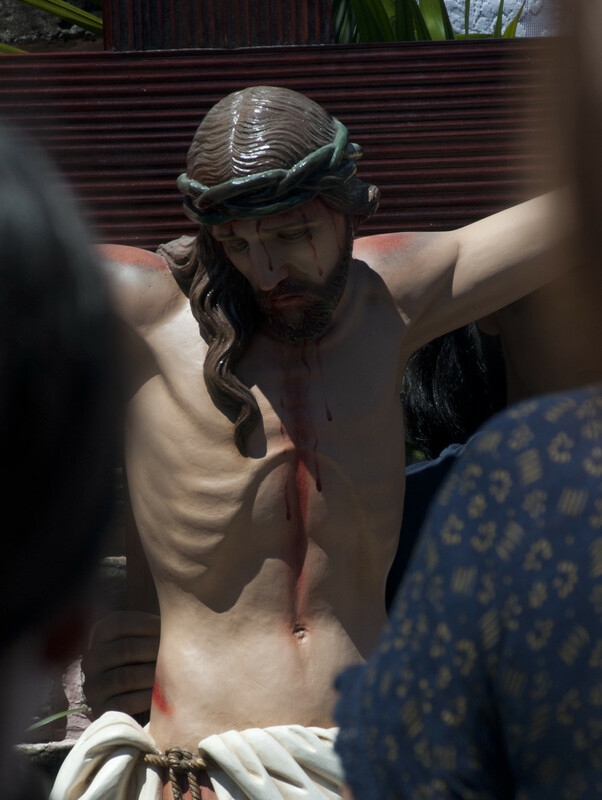 You could also list the Sukkot blessings or draw pictures of the seven species listed in the Bible: wheat, barely, grapes, figs, olives, pomegranates, and dates. Finally we were ready to put a family into our sukkah. We gathered up some Playmobil people and furntiure and taped them to the floor of the sukkah so they wouldn't slide around. We just used a table and chairs, but you could add a bed if your model family is going to dwell in their little sukkah for real! Last, but definitely not least, we glued some leaves onto our schach. 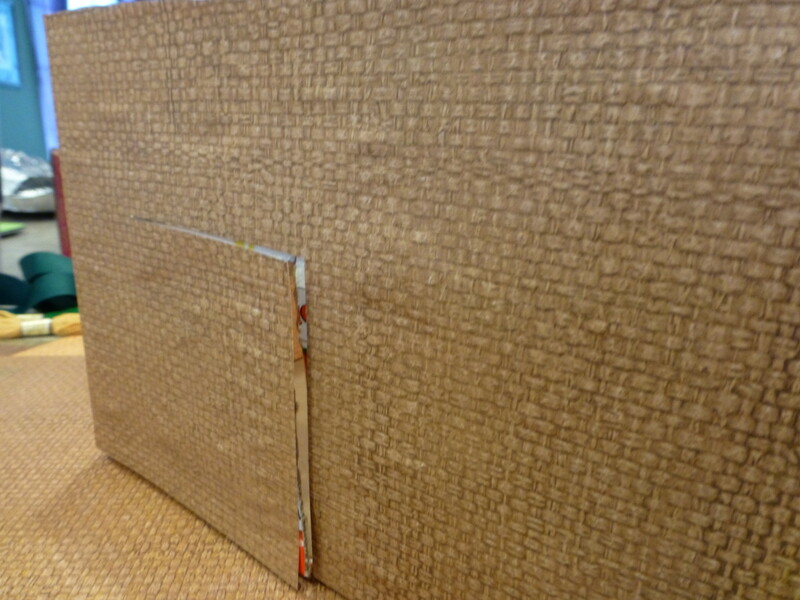 The schach of a real sukkah should ideally consist of cut branches (large palm fronds are usually used in Israel), but where such material is not readily available, narrow wooden boards or loosely woven bamboo mats are common. 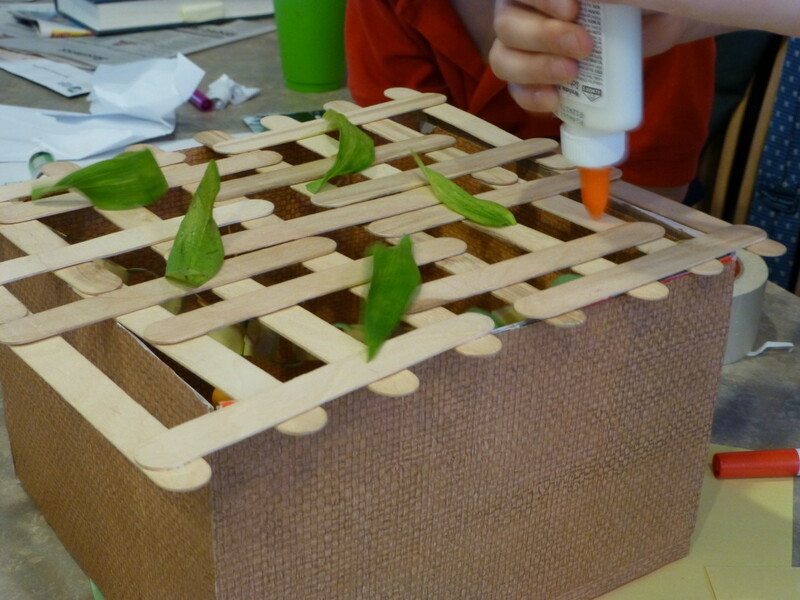 Since we had made our schach from wooden popsicle sticks, we glued on the leaves for some greenery and an authentic look. Ericka, that is wonderful to hear. I hope you and your family had a joyous holiday and had a lot of fun spending family time together making your model sukkah! Also, thank you for clarifying your paper chain ideas. Now it is also clear you did make "paper" circles as indicated because in the photo the circles look made entirely from masking tape. Also, the picture of materials shows skinny sticks, which I believe are different from "popsicle sticks"..correct?? Of course! You should definitely use your creativity here and whatever materials you have around the house. What we did was cut tiny rectangular strips of paper and then form them into circles. We used little strips of tape to hold them together, but a single dot of glue would be easier, if you have time for it to dry. "Then they decided on a pretty paper chain. This took real patience and perseverance, since my daughter had to cut tiny pieces of masking tape to make the paper circles. (Glue would work better, if you have the time.)" Glue and paper? Instead of tape? More details please! "We came up with the idea of gluing popsicle sticks into an openwork pattern, since we didn't have any long enough to go across by themselves." An alternative would be overlapping the sticks to make them longer so that they can go across in one direction..correct? Thanks, Heather. 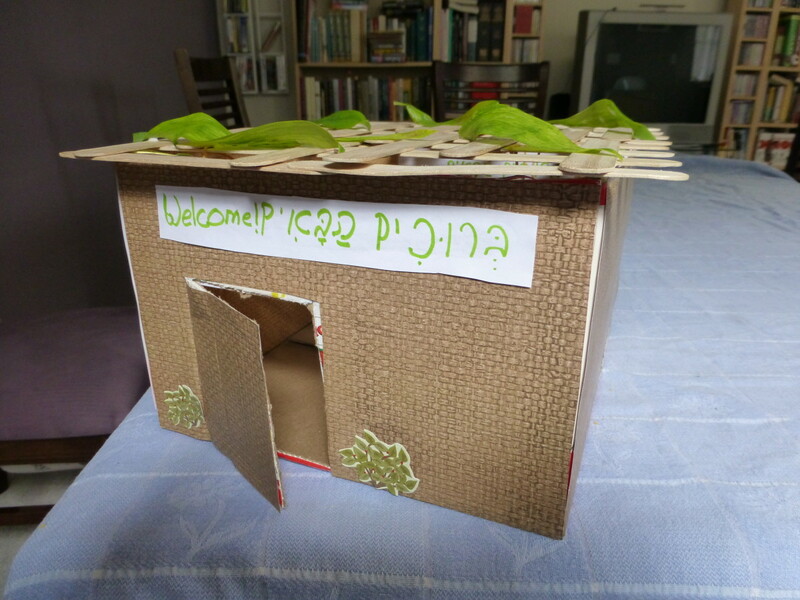 My kids and I had a lot of fun making this model sukkah last year, and if we have time we may make another one this year. I'd love to do a slightly larger-scale one for Barbie (with pink decorations, of course). You're welcome, tirelesstraveler. I've got lots more hubs on Jewish topics that you can explore! Jewish culture fascinates me. Thanks for the lesson on Sukkot. Thank you, Eiddwen. 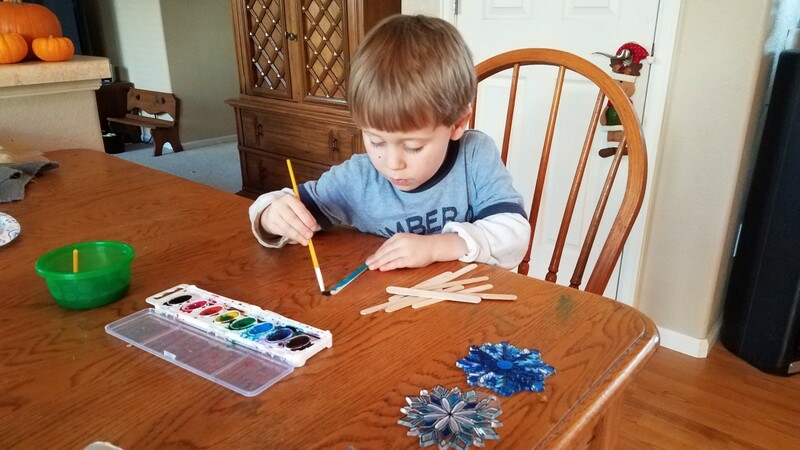 Although Sukkot has passed for this year, you can use some of the ideas here to make other "house"-type crafts with your kids throughout the year. Thank you, Jimmy. It's not surprising you've never heard of Sukkot; despite it being one of the major pilgrimage festivals from ancient Jewish times, it doesn't get as much press as some other Jewish holidays. I'm glad I was able to share my knowledge with you. Thank you, clevercat. 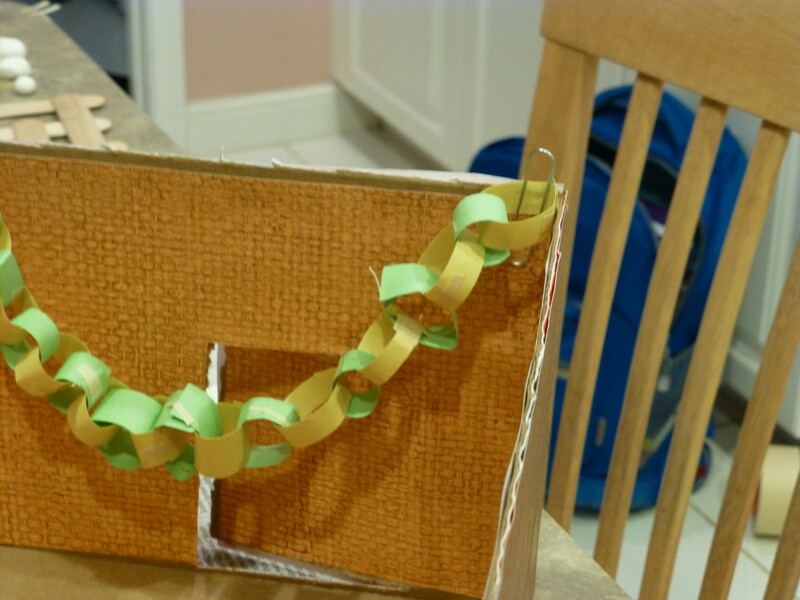 The hardest part of making the miniature sukkah is knowing when to stop decorating, because it's so much fun! Ohh, I love it! Miniature houses are always fun to make, but a topical holiday one is particularly enticing. Voted up, useful, and beautiful! Thank you, Janis. I never made a dollhouse when I was a kid, but I did always love playing with them. That's probably why I was so excited to do this with my kids. I think we all learned a lot from doing it together, too. What a wonderful project. I remember how much fun I had making little houses for dolls as a child, and this is imbued with such a deep purpose as a teaching tool for your family's faith. It is a beautiful thing to share with your children. I can see how they would get completely absorbed in it. Thank you, GoodLady. We had a really good time doing this together, and it was wonderful preparation for the holiday. How beautiful this is, how much care and detail. I can imagine how together you all felt, which made it so spiritual. Voting up and beautiful.